Ayn Rand said, "The smallest minority on earth is the individual. Those who deny individual rights, cannot claim to be defenders of minorities." In Canada, the province of Quebec is infamous for wanting to feel “distinct.” It is infamous because successive governments since about 1960 have boosted this feeling through successive laws that have decreased people’s individual liberties. The worst example—so far—is Bill 101. Among other things, it allows the government to decide whether an employer is allowed to demand that employees know a language other than French, and French must be predominant in advertising. The proposal has already caused mass demonstrations where many claim it’s an attempt to discriminate against Muslim women. But in its current form, the Loi sur la laïcité de l’État (Bill on the government’s secularity, #21) could surpass Bill 101’s infringement on people’s rights by regulating what people can and cannot wear at work. The proposed law has already caused mass demonstrations in the streets, where many claim it’s a thinly veiled (no pun intended) attempt to discriminate against Muslim women. To anyone familiar with Quebec’s history, this move shouldn’t come as a surprise. Like Bill 101, Bill 21 can be linked to the mythical era of the “Survivance” (or survival, roughly 1763-1960), when people were encouraged to hang on to the three main pillars of the survival of their “race”: faith (the Catholic religion), language (French), and institutions, now embodied with the Assemblée nationale and various government institutions like public daycare (CPE). Since the 1960s, the faith pillar has pretty much merged with the institutional one; many people now rest their “faith” in their government. But since not everyone wilfully toes the line, the institutional pillar steps in to “protect” people from themselves. With Bill 101, government barred anyone who didn’t get English schooling in Canada from going to public English schools, including immigrants. And in association with the federal government, radio stations must air 60 percent of French content during peak hours so (it must have been thought) the French culture remains vibrant and gets a fighting chance against the overwhelming American culture. A Fear of Foreign Customs? But even though French is overwhelmingly dominant in Quebec—over 77 percent of people have it as their mother tongue—it still seems that many are not willing to accept people with different customs. Although then-Premier Jean Charest said these claims were exaggerated, he still created the Bouchard-Taylor Commission of Inquiry on reasonable accommodations a few weeks after the publication of Hérouxville’s Code. Had it been commissioned in the US, people like the Pineault-Caron family would have been memed to death with the tale of their trip in “Islamistan” (Musulmanie). That religious symbols be forbidden for police officers, judges, and presidents (speakers) of the Assemblée nationale. Others, like teachers and health officials, should be spared. That the crucifix inside the debate chamber be taken down. That cities still praying before their assembly stop the practice. This one was adopted despite initial resistance from the likes of colorful mayor Jean Tremblay from Saguenay. The same collectivist language can be found in Bill 21. Its very preamble talks about “the Quebec nation and her traditions” and tries to find a balance between the “collective rights of the Quebec nation and individual freedoms.” Article 17 of the bill even amends the Quebec Charter of Rights and Freedom to insist that the “Quebec Nation puts state secularity in high regards.” Strange that before the 21st century I cannot recall a single large-scale debate on the subject except under Premier Jean Lesage in the early 1960s—when the government took schools away from religious groups. And the dispositions of the law go far beyond what Bouchard-Taylor recommended; in fact, they both oppose the bill. It extends the prohibition on wearing visible religious signs to “people in positions of authority” in daycares, schools, hospitals, and any organization that can be linked in any way to government. The Attorney General (as of April 2, at least) even said people can call the police if they find violations of the law. 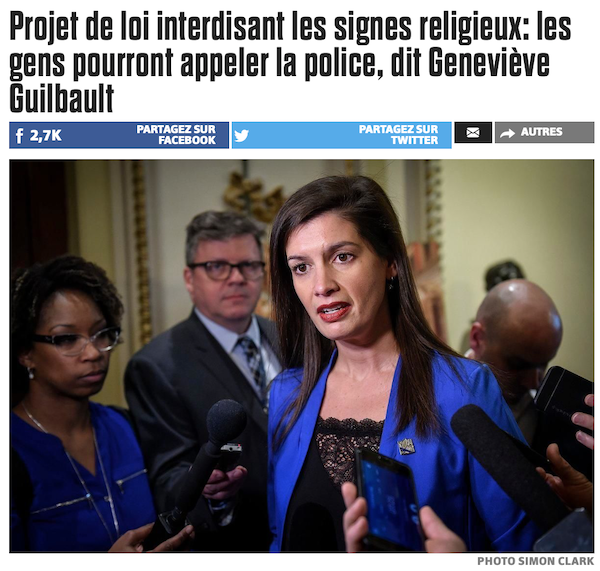 In other words, the Quebec government is about to vote on another law where the dictatorship of the majority—many insist on the popular support of the law—could prevail over individual rights in the name of “preserving” the “Quebec nation.” While there is nothing wrong with separating the church and the state, it should not become an excuse to forbid people from wearing their faith, unless said clothes are a direct danger to one’s life. The smallest minority on earth is the individual. Those who deny individual rights, cannot claim to be defenders of minorities.